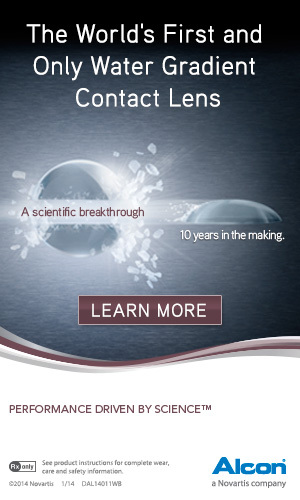 Contact lenses have been at the core of advanced optometry since they first became popular in the 1950s and 60s. Optometrists pioneered the development and created the success that is enjoyed by so many people today. In spite of that leadership position, it seems to me that contact lens procedures have not changed much in the past 30 years. Contact lenses offer an excellent opportunity for profitability, but I think many ODs have lost their enthusiasm for this form of vision correction. It is time to rediscover the rewards of prescribing contact lenses. Embrace them and you will grow your practice. There is a strong resurgence in fitting specialty contact lenses, including scleral lenses, reverse geometry designs and other exotic lenses. These are useful in a variety of hard to fit cases, including keratoconus and also orthokeratology. I think it is smart to embrace this specialized work, but let’s also realize that the population that is interested in these specialty lenses is limited. We should also build an excellent system for prescribing disposable soft lenses that appeal to a huge population. Specialty rigid lenses require significant time and expertise, while many soft contact lenses can be prescribed quite easily and quickly. Here are the key factors I would change to maximize contact lens profitability. This has been a problem for decades: very few optometrists bring up the idea of wearing contact lenses to patients, unless they brought it up first. I don’t know if most ODs don’t have time during an eye exam or if they would just rather not fit contacts. It is crazy to me. Let’s make contact lens fitting so easy and so well delegated that you break this habit. If doctors simply act enthusiastic about contact lenses and ask patients to try on a free trial pair, they could fit twice as many patients as they do now. Contact lenses can be extremely profitable with vision plan patients because you can still set your fees and collect most of it in many cases. Some vision plans provide an allowance to be used toward the fitting and lens materials and you are allowed to bill the patient for the amount not covered (less a small discount). These plans are excellent and if you see many of these patients, you should proactively recommend contact lenses. Other vision plans place a cap on your fitting fees and allow very little profit on the sale of contact lens products. In these cases, it may not be in your best interest to be so proactive. We’ve been hearing this strategy for years, but most ODs I work with still charge too little for fitting or evaluation fees. We must remain fairly competitive on lens products (although we simply can’t match the lowest of the discount retailers), but you can and should charge a healthy evaluation or fitting fee. Cover your additional time and expertise and include one or two follow-up visits plus some time for your technician to review lens handling and care. I also require corneal topography on all new fittings and at every annual exam. The professional fee is expensive, but we provide excellent care and people want that level of service. If our fitting fee is too high for some patients, we happily let them go elsewhere. We know contact lenses are available at lower prices and we understand. We manage to stay extremely busy with contact lens patients in spite of low priced alternatives. To truly maximize profitability in contact lens practice, we must delegate more of the process and reduce chair time! Technicians can gather most of the data, review the lens types and place an initial trial pair on the eye. The technician, working under the doctor’s supervision, can also over-refract and record acuity. The doctor will check the fit with the slit lamp and the fit is done. Technicians can also perform the entire follow-up visit if the patient has no complaints, good acuity, and a normal slit lamp exam. Years ago, contact lens fitting was fairly complicated, but most of it really isn’t today. Some ODs still favor complex office policies and procedures with the hope of impressing patients with the big ordeal. In my experience, patients are more impressed if the fitting process is fast and easy.